Government and defense agencies require well-maintained equipment to stay productive. Many organizations face strong political pressure to deliver results for their constituents, which is why keeping major projects on schedule and on budget is essential. Having access to quality replacement parts is an important component of your success. When you have a dedicated partner such as Gregory Poole, both scheduled maintenance and emergency repairs are faster and simpler. Let us match you with the parts you need to get the job done right the first time! Gregory Poole is the exclusive dealer of Cat equipment in eastern North Carolina and an authorized representative for both Hyster and Yale forklifts in eastern North Carolina, South Carolina and Virginia. We carry genuine OEM parts for all three manufacturers’ heavy equipment, power systems and lift trucks. Our knowledgeable staff undergoes regular training to stay current with the latest equipment by all brands we service. 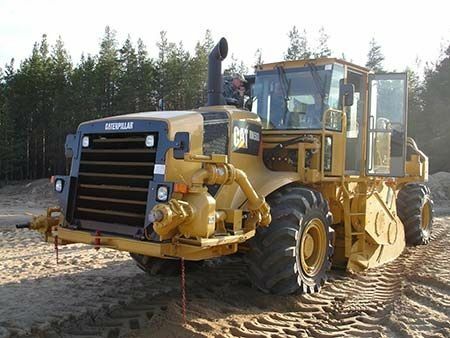 If your fleet includes Cat equipment, another important benefit of choosing Gregory Poole is Parts.Cat.com — an exclusive, 24-hour online portal where you can place your order for genuine Cat parts. Whatever your fleet consists of, we’ll work with you to put together a complete and accurate package of replacement parts for any major repair. This saves you time and reduces the risk of a missing or incorrectly ordered item causing extended delays. At Gregory Poole, we’re proud of the work we do supporting the state, county and municipal government agencies that are building and maintaining our nation’s infrastructure. We are unparalleled in our ability to deliver new parts faster — we can deliver 97.5% of items in 24 hours or less, and 99% within two business days. We also have a network of parts drops throughout our service area for your convenience. Find out more about your options for new parts or place your order today by contacting a Gregory Poole representative by phone or email.